The Nordic council of trade unions representing 16 trade union confederations in the Nordic Countries and through them, 9 million workers, calls for justice for trade union leader Larisa Kharkova, the chairperson of the independent trade union center CNTUK, union leader Amin Eleussinov from Kazakhstans’ Oil Construction Company OCC and Nurbek Kushakbayev Vice-chairman of the CNTUK and labour inspector at OCC. Kharkova was sentenced to 100 hours of forced labour, four years of restriction on freedom of movement and a five-year ban on holding any position in a public or non-governmental organization. Eleussinov and Kushakbayev were sentenced to unconditional prison terms of two and two and a half years respectively. The sentences follow the suppression of workers actions, including a hunger strike in Kazakhstan’s Oil Construction Company OCC. The penalties imposed on the trade union leaders are in violation with fundamental workers’ rights and international law. The suppression of rights ensured by international law and ILO conventions, as well as the countries own constitution, is not only a travesty of justice and an affront to democracy, it will also harm the development of the country and the standard of living for workers there. 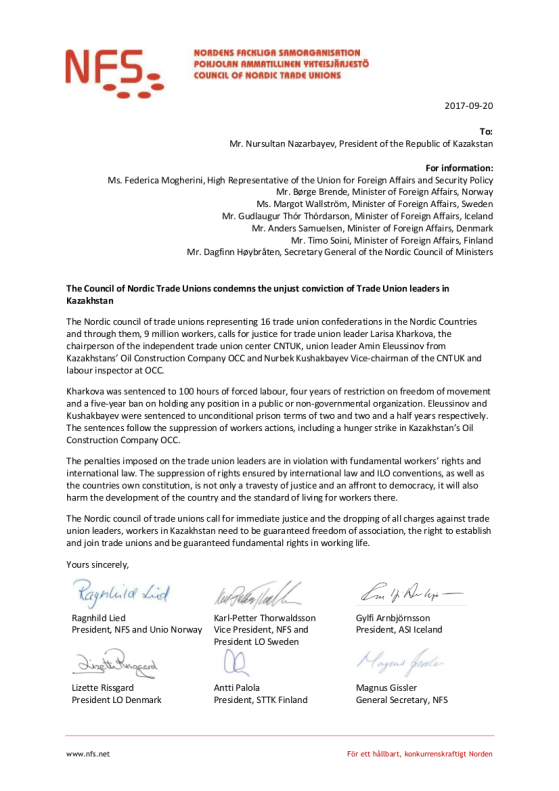 The Nordic council of trade unions call for immediate justice and the dropping of all charges against trade union leaders, workers in Kazakhstan need to be guaranteed freedom of association, the right to establish and join trade unions and be guaranteed fundamental rights in working life.